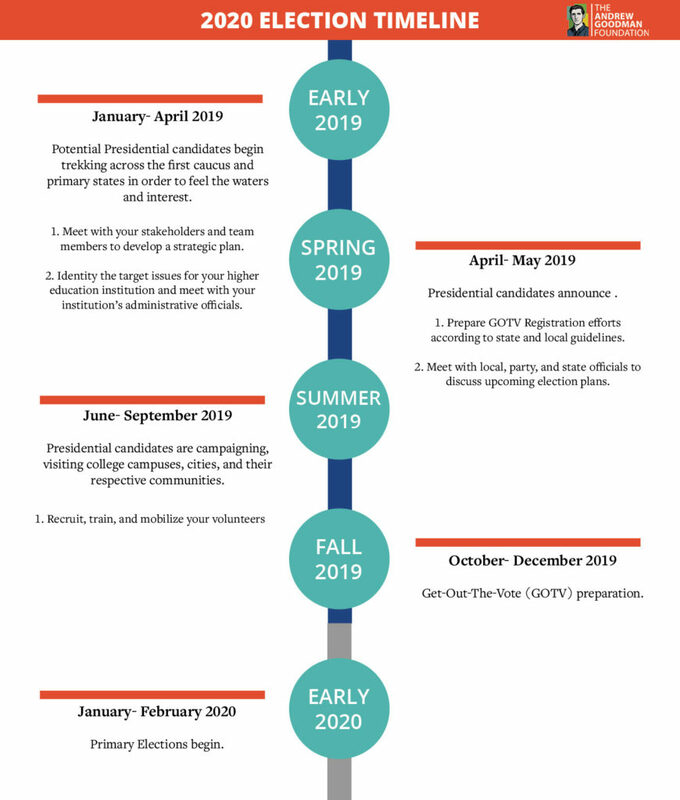 The AGF Alumni Association’s Executive Board reflects on how college campuses can keep the momentum going for the 2020 Presidential Election. 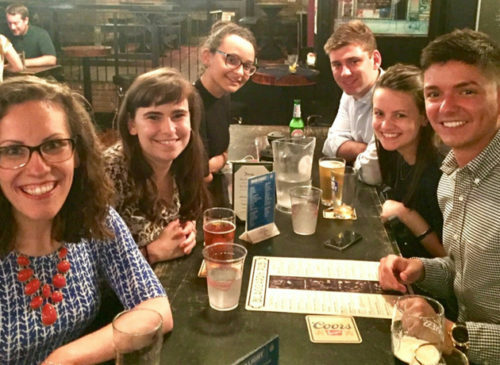 It’s tough to advance and accomplish civic engagement work without a strong team. Quality outweighs quantity; most Vote Everywhere schools only employ two Vote Everywhere Ambassadors and this hasn’t impeded them from changing state laws and bringing polling sites to their campuses because they built a strong team to support them and their efforts. Think about the strengths and weaknesses of each of your team members and decide who will be the point person for each step in your action plan. The future can’t be predicted, but anticipate necessary adjustments and try to prepare backup plans. Lastly, maintain the skills developed from the beginning sessions with routine contact and strong communication. Have frequent meetings, in-person if possible, as well as follow-up messages and emails to help keep all of your volunteers up-to-date and in-the-know about the status of their work. Don’t forget to make sure your team feels appreciated — highlight progress and mini-successes as they occur. This is a team effort, after all. Part of what makes campus organizing successful is a strong infrastructure. It is critical that students evaluate the resources available to them around their college campuses — everything from harnessing the energy, experience, know-how of administrators and faculty, to leveraging the influential groups. This might include SGA, campus organizations, and surrounding communities, or local worship centers and temples. Don’t reinvent the wheel, however. Find out what your university is already doing and utilize its resources. Once these relationships are sustained, work together to create a streamlined effort of civic engagement. Delineate and agree upon everyone’s role in the next year and a half of work. Fill the gaps and work together. Every state has its own election laws and procedures. Even within a state, every county operates differently. While knowing your state’s election laws may seem intuitive, all too often students forget to learn their local election laws. Localities have a lot of discretion in how elections are administered, and therefore a strong partnership and understanding can be beneficial to any university’s voter registration team. Get to know your local election official by sending an email or making a phone call to your local election body (may be called a board, registrar, or election office), or attend their public meetings. You may also go to your local election body’s website to see if they publish their regulations online. Depending on your state, some questions you may have for your local election body include: Where is the closest polling location to your campus? Whether your locality accepts student ID as voter ID? What are the least/busiest hours for students to get to the polls? And how much time do the officials recommend students give themselves to mail their absentee ballots? This research will allow you to be a resource to your team and develop a strong GOTV plan. Once a team has done their research and pinpointed where potential registration and voting issues may be, it is best to develop a plan that can reduce voting casualties. The Allegheny Vote Everywhere Ambassador team is an exemplar of this strategy. When the Allegheny Ambassadors registered students, they noticed a misconception affecting nearly a sixth of every registered student — the voter registration official claimed all students registered in a previous address could not vote without canceling one or the other. To curb these issues, the Ambassadors simply asked students if they were previously registered or had computers set up so that students could check their status. Understanding that students may become indifferent to re-registering after failing the first attempt, it is important to meet the students halfway by proactively providing a solution. 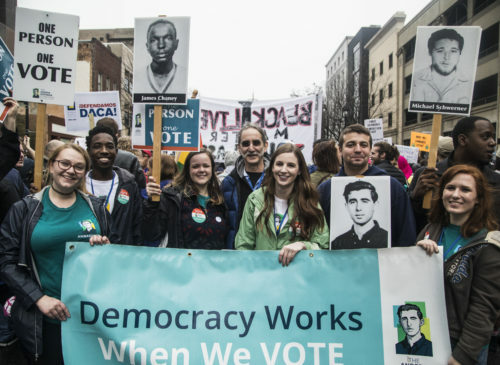 For the outsiders reading this: Now is a good time to consider becoming an Andrew Goodman Foundation Vote Everywhere campus. Vote Everywhere is a selective program currently housed on 54 campuses across the country. Campuses are actively recruited into the program by AGF staff members. The Foundation provides its campus partners with weekly one-on-one guidance, an intensive annual training, student funding, event funding, and a variety of other resources. Unlike other programs, The Andrew Goodman Foundation establishes a long-term relationship with each campus partner and requires that each university enters into a memorandum of understanding with the Foundation. 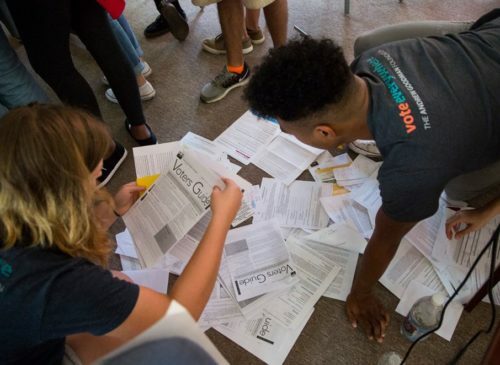 Our experience tells us that it takes time to build an effective voter engagement program on your campus — there is a lot to learn and a lot to do. You cannot leave planning off until the month before a major election. For more information about program benefits, and to express interest in joining the campus network, click here. Former Secretary of State Colin Powell once said, “Leadership is solving problems.” Every college campus will face issues regarding mobilization, bureaucracy, or working with an indifferent and oppressive local government. However, with some research, a strategic plan, and a dedicated team, college students can make an even greater impact in 2020. Democracy thrives with forward-thinking and dedicated young leaders.